When we think of a cyberpunk dystopia we imagine a world controlled by robots or an evil AI, and a place where humans are in the down low, trying to survive day by day in the gutter. What happens when someone turns these tropes to their head and this world is filled with discarded androids that live in slums, drug addicted and oppressed by multi billion neofeudal corporations? 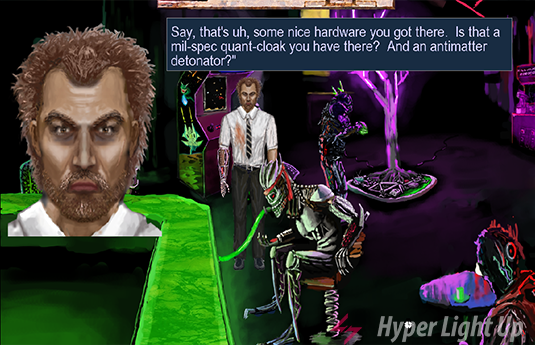 Neofeud, a cyberpunk point and click adventure created by Christian Miller offers an answer to this question. In Neofeud you take the role of Karl Carbon, an ex cop who was dishonorably discharged for shooting an unarmed sentient humanoid. His wife and kid are estranged to him, he works a minimum wage job as a social worker and his future couldn’t seem more blight. His boss demands so much out of him and he is treated like garbage. His mechanical arm is damaged and he hasn’t got the funds to upgrade it, so he must tinker it himself. Through some fateful events he gets caught in a conspiracy among mega corporations and the political games they play with each other in expense of the 99% of the population. This population is filled with humans and robots alike, both discarded and left to rot the moment they serve their purpose. As a player you will navigate this world and its denizens, from the slums and the shady nightclubs to the feudal sky palaces and beyond. From the get go the player is being introduced in a dark future, but not in a way we imagine it from movies. This future echoes our everyday life, situations and events that happen today around the world seem to have resulted in the world of Neofeud and you need only a bit of imagination to see how things could turn that way even in our world. Christian Miller was inspired by real life situations and he tried to carry his experiences over to the world of Neofeud. 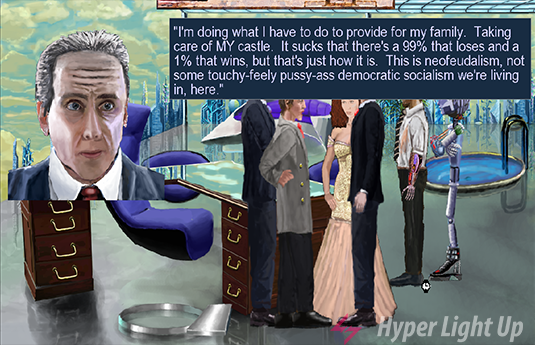 The story is the most important part of Neofeud and it gets presented in a very gripping way. Cristian Miller knows his stuff and his inspirations show throughout. The works of William Gibson, games like Deus Ex, Shadowrun Returns, Fallout and Technobabylon, even the political intrigue of Game of Thrones were the building blocks that create the world of Neofeud. 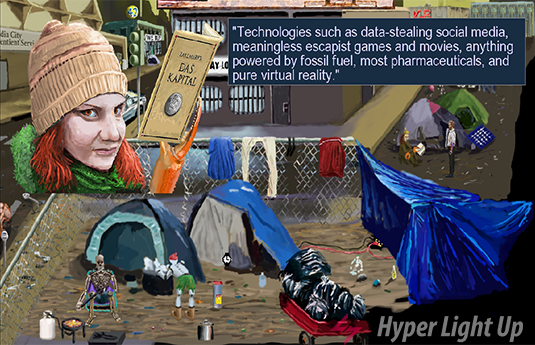 Fans who have delved into cyberpunk will feel right at home. The fact that the developer is also a published author shows in the text of the game. Usually it is a lot, filled with exposition and sometimes covering most of the screen and the artwork. It was bothersome at times but I didn’t mind that much because I wanted to know more about this world and its characters, I was intrigued and always interested to see what happens next. Besides the political power plays, there are philosophical questions that get explored from the characters that take you in a trip similar to the one Matrix did for fans when it released. The game is a point and click adventure with puzzles that you have to solve to progress the story. The puzzles thankfully are not hard and the items you will need to solve them will either be in your inventory or in the area Carl is. There were a few times where I had to think hard and finding the solution took me close to an hour but in the end it clicked and I did the correct combinations. Remember that most of the puzzles are logical and you don’t have to backtrack to other areas to find missing items, there are there, around you. Other than the puzzles, there are a few action scenes in the game, like shootouts or a stealth approach with a spaceship. If you fail, then the character dies. The problem with these scenes is that you will need to approach them with trial and error, you will have to try stuff that end in you dying. I couldn’t always guess what I had to do and at some points I felt lost, until I performed the exact movements. The fortunate thing is that after dying, you restart exactly before the action so you won’t lose time walking back and forth. I like not knowing much information before I review a game, the only thing I do is watch the Steam trailer in order to get a basic idea about what kind of game I am about to review. I must say, the moment I watched the Steam trailer, I didn’t like the visual style. It felt all over the place, like someone had stitched cardboard cutouts together. When I began my playthrough, the game icon that shows on the Windows task bar was the default Adventure Game Studio icon. Immediately I thought that this must be a pretty amateur work, something that someone made in a few days just for kicks and giggles. Fortunately, if you give a chance to Neofeud and forget these first impressions, the game will reward you with detailed characters inspired by beloved films and environments that through their grittiness can still focus on the important and create majestic and surreal scenes. The whole game is a passion project and, even though I still am not a fan of the artwork, I can definitely feel that passion shining as I play. In the future I would appreciate a more polished work with better animation and more clean visual style, but for now it does its work, better that I thought it would. 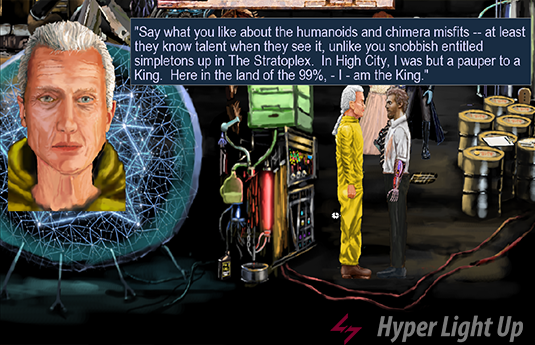 The addition of voice acting is a big deal and Neofeud, a project made by one developer, has voice acting for every character. The quality of it varies from good to just passable but still, It gives life to the world and helps with the immersion. The soundtrack is also very good, ambient synth music that felt inspired by Blade Runner and that compliments each scene. In its essence though, Neofeud is a social commentary on race and diversity. Again, the developer uses his life experience to create something that is completely applicable to our world today, and he does a great job with it. With the advent of internet, someone must work hard in order to turn a blind eye to the inequalities that happen around us. They are there, they happen all the time and someone even slight empathetic can feel bad, just reading about them online. Neofeud amplifies that feeling tenfold, it gets the player to navigate in those kinds of situations and make them think. You can buy Neofeud on Steam for the price of 14,99€. Neofeud is a dystopian cyberpunk adventure that needs to be experienced. It takes all the best tropes of the genre and applies them to a world broken by social diversity and inequality, just like ours. If you look past the visual style, the clanky animation and some trial and error action scenes, you will be treated with an adventure that will offer you many hours of play and it will make you think about our world and where it is heading. Not many indie games do that, and it is really important. I’m a huge fan of cyberpunk, W. Gibson, and dystopias, so it’s great to see a game like this doing something new in the genre. Great review, and I’m definitely going to pick this game up, thanks! Thank you for taking the time to check the review! Yes, the world of Neofeud is very interesting and I think that you will totally enjoy the game!